National Parks are filled with sounds of nature and some parks provide superlative environments to both experience and measure the natural soundscape (Lynch et al. 2011). Sound is an important part of the natural world; sound is used in a diversity of animal behaviors (e.g. courtship, navigation, detecting threats and locating prey). The natural soundscape also represents the acoustic signature of a landscape and provides a vast amount of information that can be used to understand biological patterns within the system. For example, previous research correlated indices of acoustic activity with species richness, biological and functional diversity and habitat quality (Depraetere et al. 2012, Pieretti & Farina 2013, Gasc et al. 2013). The Natural Sounds and Night Skies Division of the US National Park Service has been capturing the sounds in parks throughout the United States since 2000 to understand how humans are changing the natural acoustic environment (Lynch et al. 2011, Mennitt et al. 2013). In this study, we analysed these same data to identify broad patterns in bioacoustic activity using an acoustic complexity index. The acoustic complexity index (ACI) measures compositional changes and acoustic fluctuations and is designed to measure the complexity of a sound spectrogram (Farina et al. 2011). We applied ACI in four US National Parks (Glacier Bay, Denali, Glacier and Yellowstone) to test this metric with our sound level meter data and ask specific questions regarding changes in ACI. 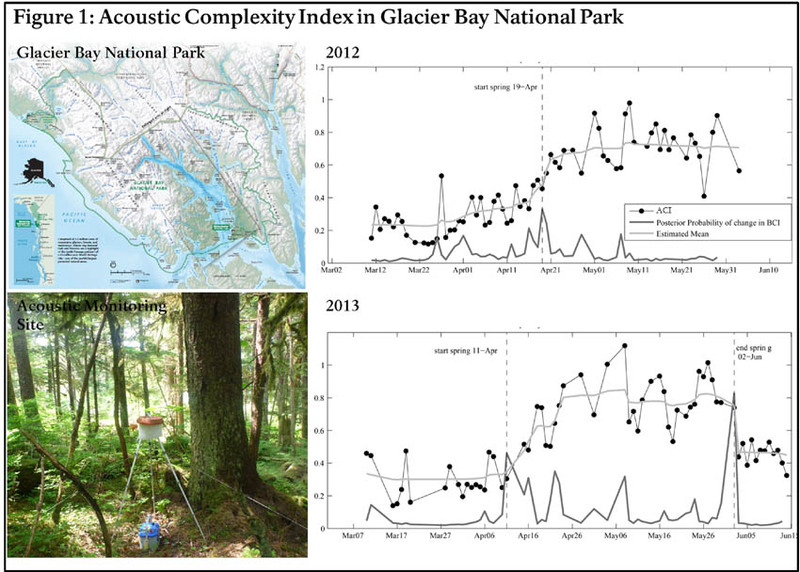 Bioacoustic activity representing migratory birds showed a seasonal shift from 2012 to 2013 in Glacier Bay National Park, Alaska (Fig. 1). In Denali National Park, Alaska bioacoustic activity correlated with various habitat parameters. Road noise was shown to influence bioacoustic activity patterns in Glacier National Park, Montana. Yearly bioacoustic activity patterns were measured at a site in Yellowstone National Park. These represent just a few examples from our dataset of more than 300 sites in 73 park units and future work will explore additional patterns to understand ecological processes within US National Parks.